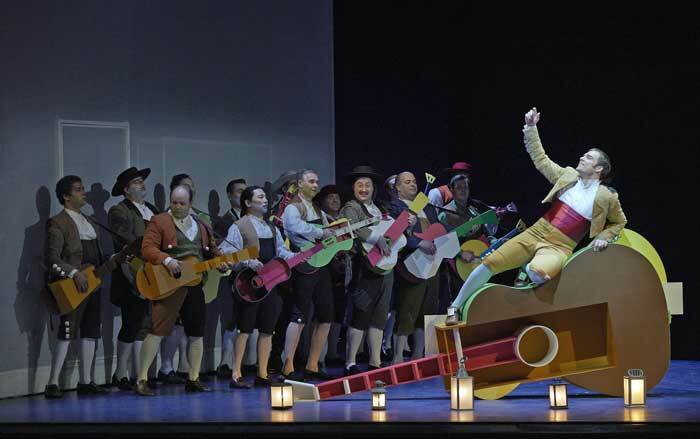 The Canadian Opera Company hired Els Comediants, a group of musicians, actors and artists based in Barcelona, who are particularly interested in creating productions that relive the ideas and feelings of communal festive occasions. 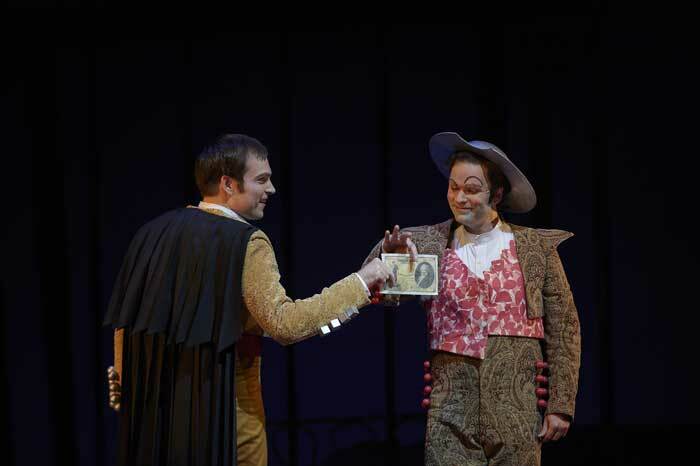 Here they turned to commedia dell'arte for inspiration. While generally liking the "freewheeling, frequently cartoonish" approach, Richard Ouzounian's (thestar.com, April 18, 2015) did not take to the "lurking mimes who look like they took not-early-enough retirement from one of Cirque du Soleil’s less successful companies" and was in "two schools of thought about Joan Guillén’s oddly constructivist set" while finding some of chorus costumes rather silly and the lighting too gloomy at the start. He was much more whole hearted about the musical side with the crisp playing of the orchestra under Rory Macdonald and singling out the singing and acting of Joshua Hopkins, Serena Malfi, Alex Shrader and Renato Girolami, with the Hopkins/ Schrader partnership being a particular highlight. 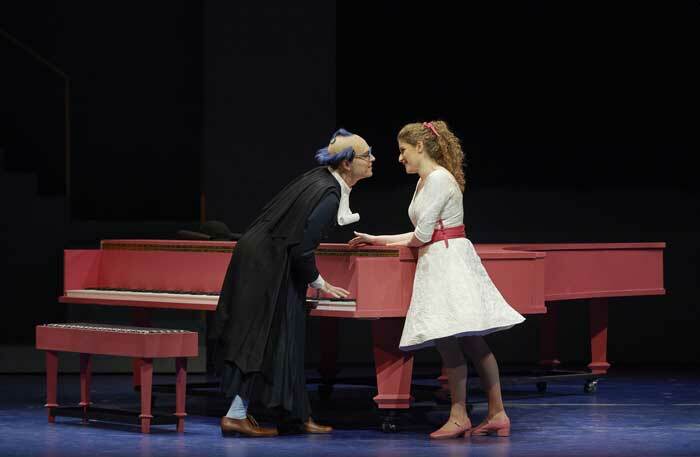 Andrew D'Cruz (The Globe and Mail, April 20, 2015) was fully in agreement on the musical merits and possibly more sympathetic to the production summing up "With its intercepted love letters, wafer-thin disguises and, yes, actors hanging from chandeliers, The Barber of Seville is full of zany buffa delights. 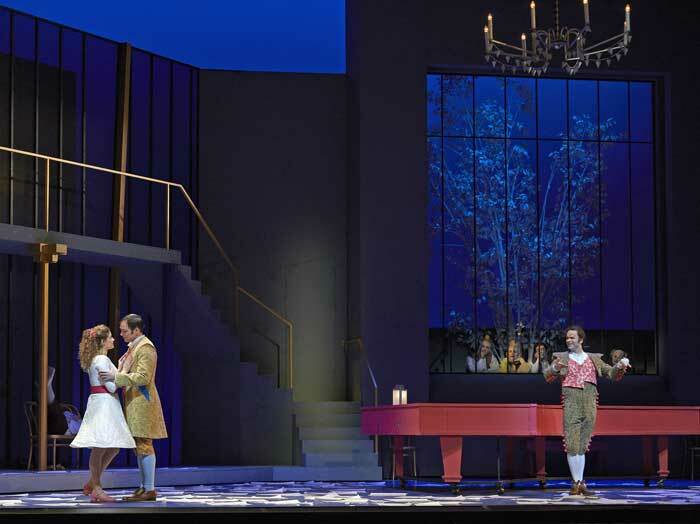 If certain elements – some seemingly underdecorated sets; the ambiguous focus on money, right up until a final gimmick I won’t spoil – fail to fully cohere, that does little to dampen the fun." 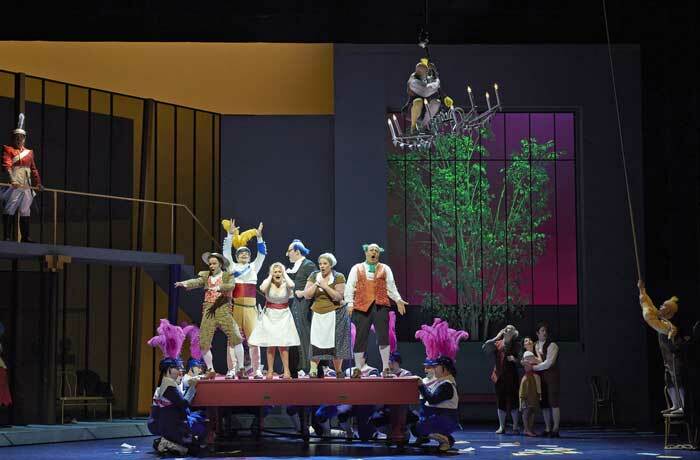 The Canadian Opera Company’s production of Rossini’s Barber of Seville is superb! 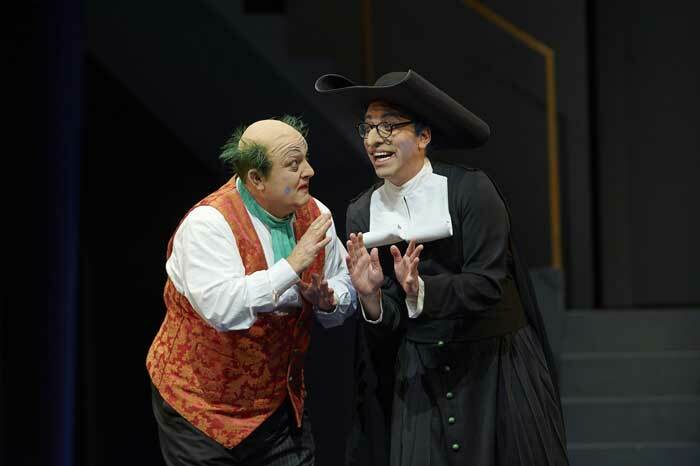 Director Joan Font channels the Commedia dell’arte style brilliantly and hilariously, ably supported by fellow Spaniards Xevi Dorca (choreographer) and Joan Guillén (set and costumes). 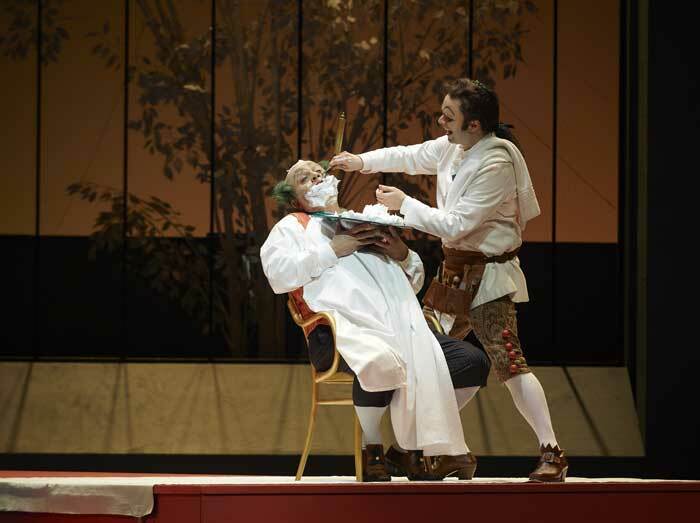 All roles are outstanding, especially Robert Gleadow as Don Basilio who brings highly amusing life to a character I barely noticed in previous productions. 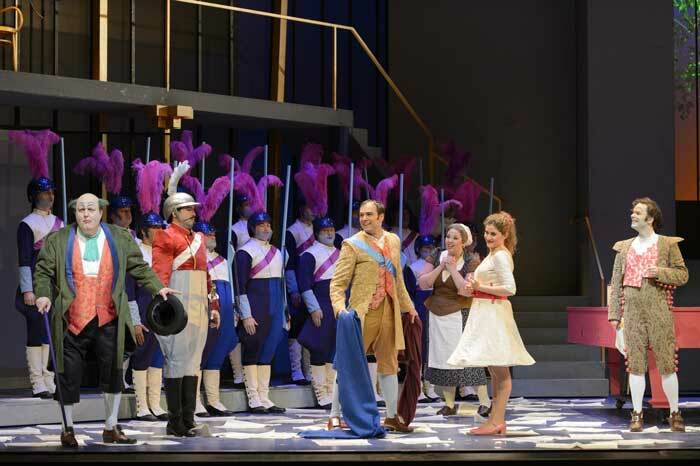 Also worthy of platinum stars, Serena Malfi as Rosina and Aviva Fortunata as Berta.